The Murphy bed, also known as a wall bed or pull down bed, is hinged at one end and folds against or into a wall unit, closet or cabinet.1 Murphy beds are great for space-saving purposes and are popular in places and cities where living and floor space is limited. How Did the Murphy Bed Receive its Name? 959), the son of a gold-seeking 49er who came up with the concept. Some sources state that Murphy created the bed to save space and create enough room to entertain his friends in his tight living quarters. Even after 100 years the Murphy bed is still a staple of efficient living. Although not as popular as they used to be, the Murphy bed proved invaluable in the face of disaster. The San Francisco earthquake and subsequent fire of 1906 caused heavy damage, nearly leveling the city. As renovations began in the wake of the disaster, Murphy beds gained popularity in rebuilt buildings designed to maximize space in the city’s already small living quarters. The Great Depression severely affected sales and production of the Murphy bed due to decreased availability of materials used to create them. In 1989 a court ruled that the Murphy bed was no longer entitled to its trademark protection, as it became a generic term for beds that folded into walls, regardless of whether it was a Murphy model or not. At Desq we’re proud to carry on the Murphy bed legacy by offering our customers these functional pieces of furniture and history. Desq wall beds can fit any space and stay hidden until the moment you need them. They are available in a wide range of material, hardware and finish options. 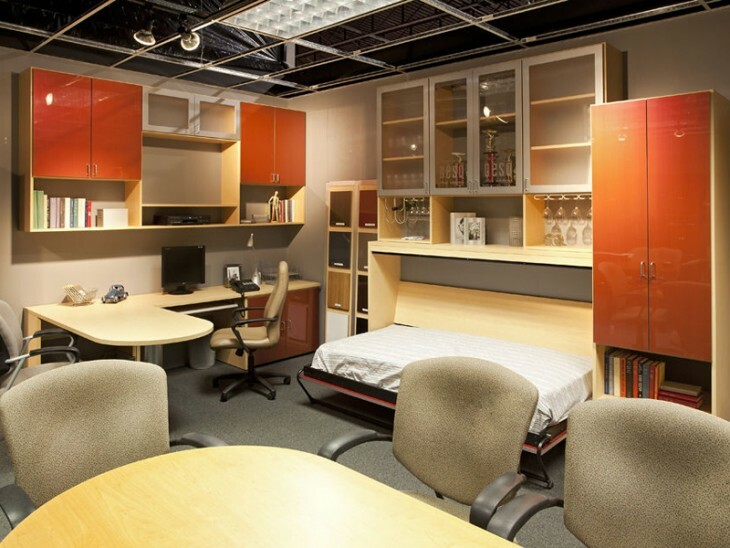 We also provide complimentary space planning and estimates to custom design a Murphy bed to your exact specifications. Contact us to purchase your very own Murphy bed today!